The main purpose of the International Olympic Day celebration is to make the holiday for children. Waiting on the truly bright event a great number of young sports fans and their parents came to the Olympic sports complex long before the official opening. By 11 am 36 sports zones began to work for visitors. None of them, in the end, did remain without public interest. Archery, karate, athletics, rhythmic gymnastics – here we go! Winter sports as biathlon, curling and hockey were also very popular despite the extreme heat, mysterious korfbol and frisbee, strict aristocratic golf – all attractive and interesting to take a brief training course on the chosen discipline. A number of activities were offered to the guests by the sponsors and partners of the event. The ground of the 2nd European Games offered visitors face painting, branded balloons, pins with the emblems of the upcoming sports forum, souvenirs. Our bright branded zone also included a big wall for paintings, arranged sports quiz, and gave the opportunity to be photographed and chat with famous Belarusian archery athletes Ekaterina Timofeeva and Pavel Dalidovich and much more. – This day, first of all, is dedicated to the young sports fans, who are very curious. If a child at least once saw the logo picture or information about the games, then he will ask parents to come and see them live. I think we achieved our goal to promote the Games here – said CEO of MEGOC George Katulin. 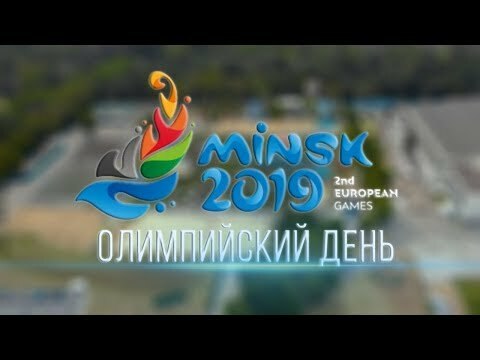 During the day famous athletes often mentioned the upcoming European Games in Minsk and were open to chat with the visitors of the celebration. Biathlonist Nadezhda Skardino, freestyler Anna Guskova, hockey player Mikhail Grabovsky… Where else will you find so many sports stars open to communicate? The program of the event also included the Olympic Quest, which asked to perform 20 tasks (one per sport). Each participant received a special card with 20 squares for seals from representatives of sports grounds, as well as a visual brochure with a map of their location and information about the 2nd European Games of 2019. Seals were stumped for the successful completion of each of the tasks. Ten seals on the card let to win a sports bottle, 15 seals – a bag. Finally, the most active children with 20 seals were awarded a special clock with a pedometer. A commemorative plaque in honor of the start of the construction of the national stadium for beach soccer was opened today in Minsk during the celebration of the International Olympic Day. There were numerous selfies, unforgettable impressions and a storm of positive emotions. And, most importantly, those who at the International Olympic Day has firmly decided to go in for sports professionally, have received full information on how and where to realize their dream.